We’d love your help. Let us know what’s wrong with this preview of People Habitat by F. Kaid Benfield. With over 80 percent of Americans now living in cities and suburbs, getting our communities right has never been more important, more complicated, or more fascinating. Longtime sustainability leader Kaid Benfield shares 25 enlightening and entertaining essays about the wondrous ecology of human settlement, and how to make it better for both people and the planet. People Hab With over 80 percent of Americans now living in cities and suburbs, getting our communities right has never been more important, more complicated, or more fascinating. Longtime sustainability leader Kaid Benfield shares 25 enlightening and entertaining essays about the wondrous ecology of human settlement, and how to make it better for both people and the planet. 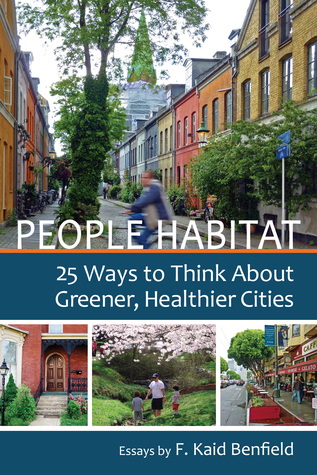 To ask other readers questions about People Habitat, please sign up. One thing I am constantly reminded of when reviewing the many books I've had the opportunity to read is that, even though all the varying topics thrill me, they are not my current profession. As a result, I am sometimes worried that my words don’t carry as much weight, as I have only experienced from a single vantage point. F. Kaid Benfield changed that outlook for me in People Habitat, as he is himself a lawyer—not an urban planner, not an architect, and not a designer, although he has friends One thing I am constantly reminded of when reviewing the many books I've had the opportunity to read is that, even though all the varying topics thrill me, they are not my current profession. As a result, I am sometimes worried that my words don’t carry as much weight, as I have only experienced from a single vantage point. F. Kaid Benfield changed that outlook for me in People Habitat, as he is himself a lawyer—not an urban planner, not an architect, and not a designer, although he has friends who are all of the above (much like myself). It was truly a witty and interesting ride to take with Benfield as he charged through several differing topics related to our urban (and suburban) environments. There was a sense of rawness to it that you don’t see when someone has meticulously worked in their profession for years. This also lends itself to a broader view (and sometimes odd assumptions) of where the state of our progress into our urban environments is at. The book itself is comprised of twenty five essays, all of which cover different topics that have to do with “People Habitat[s]”. The titles are as diverse as the topics with examples like, What Seems Green May Actually Be Brown, or In a Revitalizing District, Some Gentrification Might Be OK; but Not Too Much. The book goes on with twenty three more of these personally charged essays about all sorts of elements that factor into our urban world. My own belief is that we should be working for revitalization that encourages mixed-income neighborhoods in which new residents and businesses are welcomed while displacement is avoided or minimized. But make no mistake: the revitalization must continue to take place in America’s cities. It is absolutely essential if we are to have any hope of a more sustainable tax base to fun civic restoration and improvement, a more equitable civil society, and a more environmentally sustainable pattern of growth that reduces sprawling consumption of the landscape while bringing down our rates of driving emissions (central locations with moderate or greater density and nearby conveniences facilitate walking, transit, and shorter driving distances). As someone "outside the field" it is empowering to see that others, beyond those only in places we assume drive change, can understand and articulate problems that appear to be only accessible to professionals. When Benfield speaks of “Dulles Town Center,” a shopping center in Sterling, Virgina and how they are planning a huge development there, visions of J.G. Ballard’s High Rise or Millennium People shivered through my spine. Both books center on the built environment, High Rise looking at a class war between people living in a building with a surplus of amenities and luxuries, while Millennium People looked at a shopping center that becomes the site of a community-based hostage situation based on the same eerie complacency of suburban living. It is as if boredom drives these ideas, and when Benfield writes that the development in Dulles has “proposed to build over 1,600 new multifamily homes and up to 5.5 million square feet of commercial space on land adjacent to the mall,” part of you feels excited that some density is creeping up around these suburban shopping experiences, but other aspects sound unnecessary in the first place. If “Dulles Town Center” is still in the middle of nowhere, will people be satiated by 5.5 million square feet of shopping (and frankly, is it really necessary)? And will this lead to the listless, seemingly innocuous battles that are prophesied in the pages of the J.G. Ballard books, where so much freedom and life in excess in the middle of nowhere ultimately leads to chaos? There were a few parts of the book I had trouble with, albeit small parts. Over the course a few sections a variety of people come under fire for certain design decisions or theories that they posit. From Brad Pitt's role in the rebuilding of homes after Hurricane Katrina, to Jeff Speck's fantastic book Walkable Cities (and the idea that Speck focuses on areas that are already easily walkable, biasing his views). This is the one drawback to opinion pieces versus fact (and I mean this in regards to the all editorial pieces) as both sides have their take as to what is right, and details can be lost in the flurry. Unfortunately, the fact that we are increasing dwelling units per acre, reducing vehicle miles traveled per capita, and reducing tons of carbon emissions compared to sprawl, does not mean that we are making [a] great habitat for people. In fact, we now see that one can do exactly these things while making mediocre places without respite, without opportunity, without nourishment. Most people would take the numbers he mentioned in the beginning, the lowered vehicle miles, the increased dwellings, and they would close the book. On the other side, someone may not be interested in those numbers at all, and may feel that beauty and creativity is what needs to be commonplace. I gave this book five stars because it opened my eyes to seeing urban planning in a new light...or at least, with a broader perspective. The author presented his point of view without climbing up on a soap box. In addition, he introduced me to other writers/bloggers on the subject. Through the many photographs, I traveled around the world and discovered new and benevolent human spaces. Often, I felt my heart open...I wanted to live in a community just like the one pictured. Mr. Benfield is a maj I gave this book five stars because it opened my eyes to seeing urban planning in a new light...or at least, with a broader perspective. The author presented his point of view without climbing up on a soap box. In addition, he introduced me to other writers/bloggers on the subject. Through the many photographs, I traveled around the world and discovered new and benevolent human spaces. Often, I felt my heart open...I wanted to live in a community just like the one pictured. Mr. Benfield is a major character in this series of essays. I found him likable, a man whose dedication to the the human landscape in balance with the "natural world" is underscored by the stories he tells about his own way of life. Urban planning for him is not only a mission, it is a bicycle ride through his neighborhood. I do admit to having difficulty with the first half of the book which felt repetitious to me. And was surprised by the chapter focusing on religion...not so much that it was included...it seemed out of order or perhaps a rough transition. I love Kaid Benfield's articles, but this collection just wasn't ready for publication. He makes it clear from the start that the book could have used more work, but it still was a disappointment to read so many half-baked articles. An intuitively-organized and relatively up-to-date resource on the topic of new urbanism.